So as you can obviously see, I have been waiting for this book to be released for a long long long time! The Rise starts off right where Half Black Soul ends, and it doesn't disappoint. 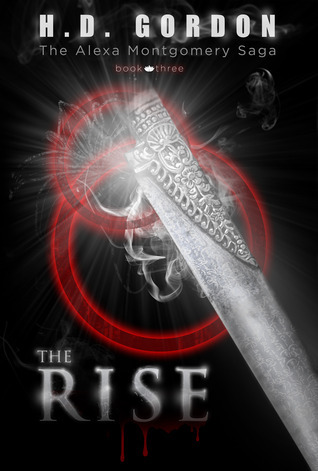 Like the last novel, The Rise is mainly switched between two different POVs, Alexa and her little sister Nelly. Although, it's mainly between these two characters there are also less common POVs, from the evil and diabolical King, Alexa's boyfriend, Kayden, and last but not least Jackson, Alexa's werewolf friend. Alexa is badass, maybe even more so, than she was in the last two books. Sometimes she can be a little rude and has some certain anger management problems, but that's understandable because if you really think about it, she's still just a teenager, thrown into a world she still dosen't understand. Into a world where everyone thinks of her as their savior, a person who was going to defeat evil once and for all. I don't know about you, but if I was in her position, I would be feeling a little pressured as well. Another great thing I loved about Alexa's character, was that she had alot of conversations in her head. When she feels her monster rising within her, demanding that she solve things with violence, she beats her "monster" side into submission by acting as if it was another person. And the only way to pretend that it was a different person was to give that person a separate voice. That made for some very....interesting conversations, because she was essentially arguing with herself. Even though Alexa tends to be violent and harsh, she also has a softer side to her. Sun Warriors tend to be motivated and driven by either anger or love. After protecting her sister for years and years, a bond sprang between them. There was nothing in the world that Alexa would not give up for her sister. Even her life. Although Nelly is not strong in the physical sense, she is undefeatable in the mental sense. If you have read the past two books you would know by now that she is Half Searcher and Half Lamia. Her Lamia side makes her Searcher side even stronger. It was amazing to see how much Nelly grows throughout the first two books. In the start, Nelly resorted to sucking her thumb when she was scared, which annoyed me because it was so childish! But now, after all the things that she's seen, all the problems that she's faced and overcome, she grew into a character that I both respected and admired. However in the third book......let's just say that she's not completely herself. A rare HD appearance!Lucky girl Daphne, lol!